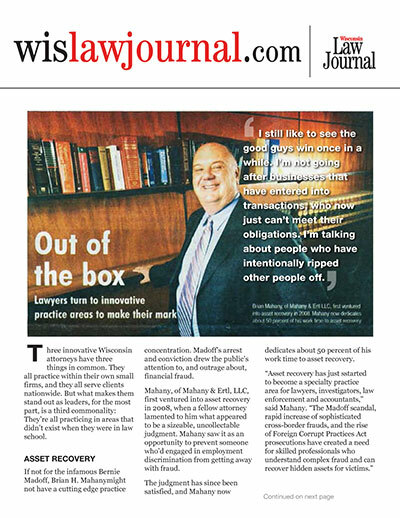 Three innovative Wisconsin attorneys have three things in common. They all practice within their own small firms, and they all serve clients nationwide. But what makes them stand out as leaders, for the most part, is a third commonality: They’re all practicing in areas that didn’t exist when they were in law school. If not for the infamous Bernie Madoff, Brian H. Mahanymight not have a cutting edge practice concentration. Madoff’s arrest and conviction drew the public’s attention to, and outrage about, financial fraud. Mahany, of Mahany & Ertl, LLC, first ventured into asset recovery in 2008, when a fellow attorney lamented to him what appeared to be a sizeable, uncollectable judgment. Mahany saw it as an opportunity to prevent someone who’d engaged in employment discrimination from getting away with fraud. The judgment has since been satisfied, and Mahany now dedicates about 50 percent of his work time to asset recovery. Mahany believes his small Milwaukee-based form is the only one in the state with a dedicated concentration in asset recovery. While private investigators and fraud experts have been around quite some time, it’s only recently that lawyers have pursued asset recovery as a concentration. What lawyers bring is familiarity with foreign legal systems.Assets are often secreted offshore, in countries where banks operate with little transparency and government oversight. Lawyers also offer knowledge of the U.S. civil legal process; for example, an investigator cannot subpoena bank records pursuant to a fraudulent conveyances cause of action, but a lawyer can. What makes the practice so rewarding, per Mahany, is “I still like to see the good guys win once in a while. I’m not going after businesses that have entered into transactions, who now just can’t meet their obligations. I’m talking about people who have intentionally ripped other people off. The words “electronic discovery” typically strike fear in clients, mainly due to the astronomical costs involved. It doesn’t have to be that way, said Kelly Twigger of ESI Attorneys in Milwaukee. With her assistance, those costs can likely be substantially trimmed in many cases. Twigger serves as “e-discovery counsel” in litigation, working with both in-house and outside counsel, offereing her independent advice — she’s not linked to any software vendor or organization.